Which side would you like the motor on. The 5600 requires wiring into the mains by a professional. This Silent Gliss Autoglide 5600 electric curtain track is easy to fit and designed especially for commercial and top-end residential applications. It is available in much longer lengths than the Autoglide 5100 and has increased motor power, supports larger and heavier curtains and has a variety of control options, including a system allowing operation through smartphone, tablet and MS Windows apps. It is a complete kit with everything you need to automate your curtains (you just need the screws or fixings for the type of wall or ceiling you're fitting to, plus standard curtain hooks for your curtains). (These two features are only available on tracks less than 12m in length). These track systems come without curtains. You can hang your own standard curtains using normal curtain hooks (not supplied). Tracks are only available in white. Silent Gliss have a device called a "Move Server" (Silent Gliss code: 9960) which connects to your broadband router, and in conjunction with a "Move Stick" (Silent Gliss code: 9961) can control up to 15 compatible wireless-enabled Silent Gliss devices featuring the Radio Control 9940 or 0450 systems. Adding another Move Stick will let you control a further 15 devices. The Silent Gliss Move Server can then be controlled by the Silent Gliss "Move" app, available for Android smartphones and tablets, Apple IOS iPhones and iPads and for Windows Desktop. We advise downloading the app for free from the respective app stores to look through some of the features in demo mode and make sure it's compatible with your devices. The Silent Gliss Move App enables you to directly control your curtain track, program set times to open and close your curtains, or use the Sunset and Sunrise feature to open and close with day and night (this feature operates using sunset and sunrise times the unit retrieves from the Internet, rather than using a physical light sensor). The Silent Gliss Move system also allows you to group multiple curtain tracks together to create "mood" groups… so for instance you create a "movie" mood, which closes all of the curtains in your lounge, and then a "night time" mood, which closes all of the curtains in your house. This is a complete kit, with track, fixing brackets, motor and your chosen control options. All you need extra are the correct screws and fixings to fit to your type of wall or ceiling, power cable to wire the motor into the mains (requires an electrician) some standard curtain hooks for hanging your curtain(s). Face the higher edge of the profile into the room side. 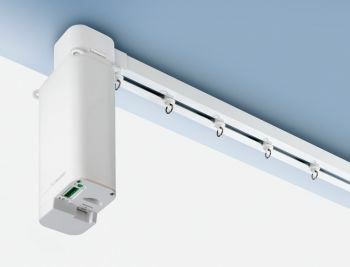 by screwing through the track directly into the ceiling without any mounting brackets. by fitting mounting brackets (Silent Gliss code 3001) and then attaching the track to the brackets. We can supply the 3001 brackets separately. using L-brackets (Silent Gliss code 3134-39), along with fixing brackets (Silent Gliss code 3041). The L-brackets can be covered with bracket covers (Silent Gliss code 3133). If you have a shaped window, such as a bay window, the track can be bent for you during manufacture. Simply select the "bending" options before placing your order. Feel free to give us a call on 01543 279996 for more information. Please note bending reduces the maximum supported curtain weight. .
Do I need an electrician to fit the track? - Yes. In addition to the physical mounting of the track, which can be carried out by someone competent at DIY, the 5600 requires an electrician to be wired into the mains.